Tara Waters is a Partner in the Corporate Transactions practice group at Ashurst LLP. She is also a mentor for the Barclays Techstars FinTech Accelerator programme. Prior to joining Ashurst, she worked for Simmons & Simmons and Allen & Overy. For how long have you been able to code? Technically, I first learned to code in BASIC in elementary school, but I suppose I got more serious about coding in my freshman year of university when I taught myself HTML — so about 22 years ago. What languages can you code in? Initially, it was about being able to create my own website that reflected my personality. I found web development easy to learn on my own and it was a skill in high demand in the late nineties, when I was in university and looking for paid work. What made you transfer to the law? A former programmer colleague of mine, who had left to go to law school, convinced me that legal logic was a lot like programming logic, and so he thought I would make a good lawyer. He told me that the legal industry needed not only more women, but people who understood how to code. It was the early 2000s, when P2P file sharing was up-ending the entertainment industry, and I saw an opportunity to contribute to a nascent area of law. Amazingly, it seems the cycle has come back around and I am finding both my gender and my technical background to be very useful as a lawyer. How does coding help you as a lawyer? I think there is truth to my colleague’s hypothesis. As a programmer, you need to understand the objectives of the programme you are writing, analyse the required inputs and possible outputs and then ensure the code addresses what needs to happen in each of those scenarios. As a lawyer, you need to understanding your client’s business objectives, analyse the facts and possible consequences and then provide advice or draft agreements which address all relevant concerns. So, there are clear parallels in terms of training yourself on how to think about and analyse situations to achieve the required result. From your experience, do you think lawyers gain an advantage by being able to code? I personally feel that I have some advantages, particularly as law and technology are increasingly intersecting. 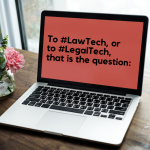 In working with clients who are either already part of the tech ecosystem or are grappling with new technologies and the challenges of digitalisation, I have found they appreciate having a lawyer on their adviser team who has a genuine expertise and understanding of the underlying tech (or, as I like to say “speaks geek”). Are there any specific examples you can provide? My ability to understand and explain complex technological concepts has enabled me to become our resident DLT expert and develop training and know-how materials both internally and for clients. For example, I’ve written our “Blockchain 101” guide, which many clients have expressed is easier to understand than some other explanations they have come across. I am also frequently tapped to help colleagues understand technological aspects of fact patterns they are analysing in order from them to apply their legal expertise to advise clients. Given the opportunity, should you learn to code first and the law second, or vice versa? I don’t necessarily think the order matters. We each bring all of our experience and expertise to the table, and it is that diversity of experience which adds real value.